Bitcoin poker continues to become a huge hit in the Bitcoin gambling industry; that is why more online poker rooms are launched on the market. 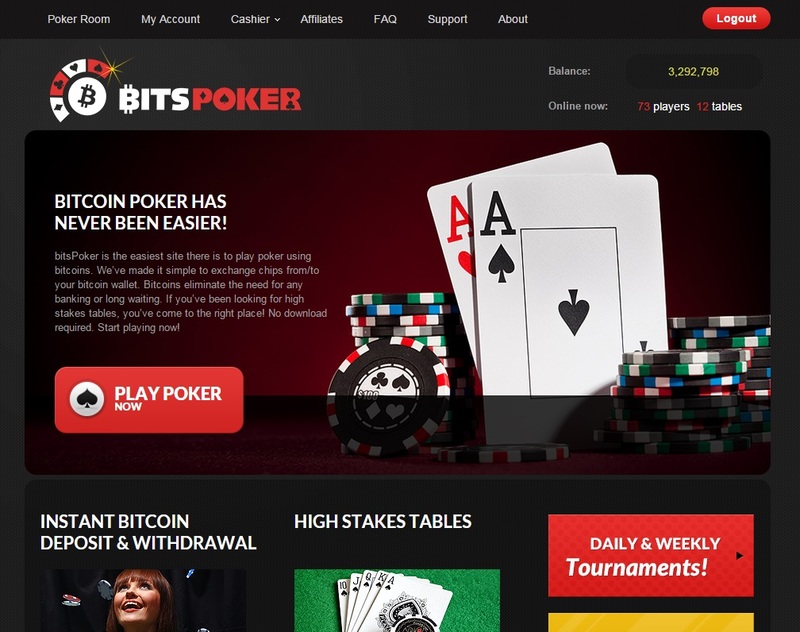 With a growing population of poker sites, BitsPoker still manages to make a name for itself, even when pitted against the more popular Bitcoin poker rooms. 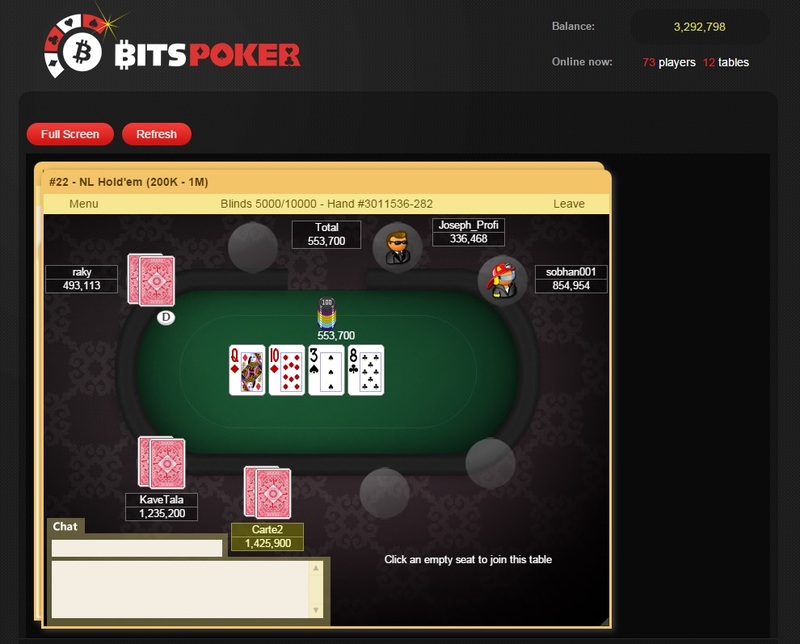 Debuting on the scene in 2013, this website’s initial offering somewhat lacks the extra oomph to capture the hearts of the avid poker players using Bitcoin. After a revamp, though, this online poker room emerges from a slump; thanks to its visually attractive interface and competitive game system. If one truly wants to shine on a rather dense market, it needs extra help from key features. 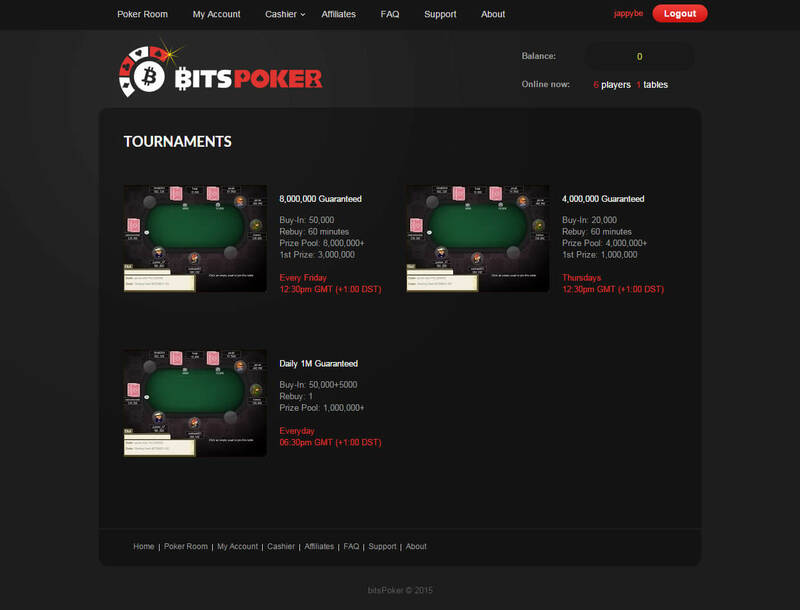 In the case of BitsPoker, it is the GTD tourneys that boast large prize pools. Hosted on this site are three tournaments that follow a regular schedule. First on the list is the daily 1M GTD tourney, which gives players the chance to win significant amounts of the prize pool. Following this is the 4M GTD tourney that happens every Thursday. If you are still looking for more ways to maximize your Bitcoin wins, you had better not miss the 8M GTD tourney that takes place on Fridays. With these tournaments, there is absolutely no reason for you to slack off. In fact, its games—No Limit Texas Hold’em, Pot Limit Omaha, and Pot Limit Omaha Hi-Lo—are enough to give you an outstanding game time. Add to these the low rake of 2% for all types of ring games and the minimum buy-in of 20,000 chips or 0.02 BTC for the 500/1000-bit table. If you want to play poker with Bitcoin, signing up is the best thing to do. After all, this site does not require you to download any poker client. Instead, you simply have to register online. You only need to key in a valid email address, a password, a nickname, and the continent you are in. By following the simple steps after, you can instantly play live Bitcoin poker. When it comes to the support, on the other hand, do not expect to find a live chat function here just yet. Perhaps, it will add this feature soon since only an online messaging ticket is available on its site. 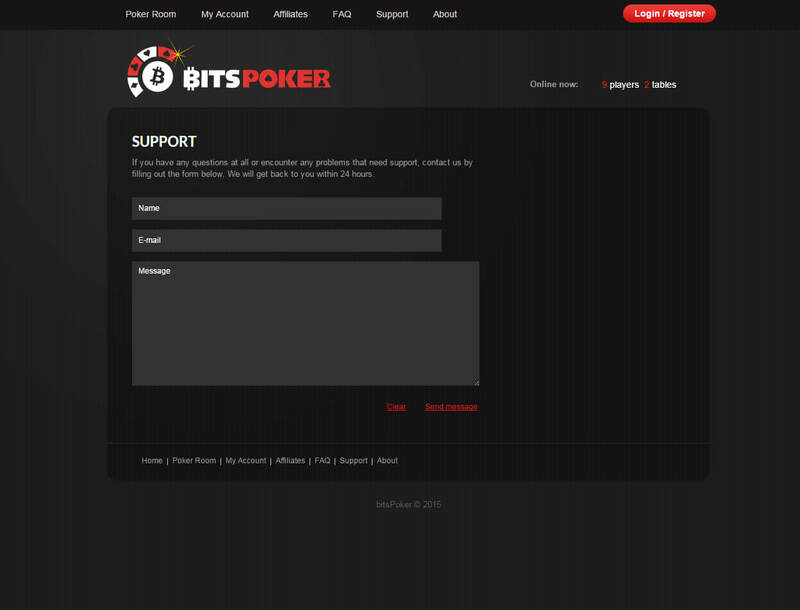 BitsPoker prides itself on the fast deposits on its platform. With only two confirmations required, all deposits will be credited to your account balance in 10 to 30 minutes. A minimum amount of 0.0005 BTC can be deposited. Keep in mind that 1 chip is equivalent to 1 bit. Therefore, you will get 1 million chips if you deposit 1 BTC. Moreover, withdrawal requests are processed within minutes too, provided that the amount is relatively small. Otherwise, cashouts can take up to 24 hours upon request due to manual verification. Is it worth playing here? Definitely. 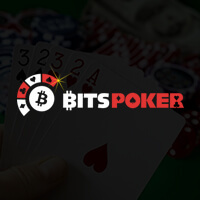 On top of the great games, tournaments, and payment systems, BitsPoker also offers an affiliate program that rewards 30% of the total profits of each of your referred players. Therefore, with all these aspects in consideration, there is no reason you should avoid playing in this Bitcoin poker room. Sign up and see for yourself what awaits you on this site.